Red Wine for Cooking: Does Price Matter? When a recipe calls for red wine, the tendency is to grab whatever is inexpensive or already open on the counter. But as with any ingredient in the kitchen, the choice of wine can make the difference between a sauce worthy of a four-star restaurant and one that’s best poured down the drain. In short, the wrong wine can turn an otherwise good sauce bad. The problem is that sifting through the enormous range of wines available is only slightly less confusing than trying to plough through Ulysses. Choosing a good bottle for the kitchen can seem like, at best, a shot in the dark. To find out which red wines are good cookers (as opposed to those which are just good drinkers), We set up three tests—a quick tomato sauce, a pan sauce for steak, and a long-cooked beef stew—through which we could test numerous bottles. With the help of local wine expert Sandy Block (who holds the title Master of Wine, an honor shared by just 18 Americans), we organized those red wines available in even a poorly stocked wine shop into four manageable categories based on flavor, body, and style: light/fruity, smooth/mellow, hearty/robust, and nondescript jug wine. Ironically, the only type of wine not represented in these four categories is the “cooking wine” found on most supermarket shelves. In previous tests, the test kitchen has found that these low-alcohol concoctions have little flavor, a high-pitched acidity, and an enormous amount of salt, all of which combine to produce inedible sauces. 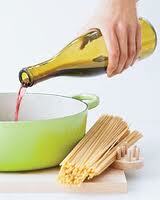 Omitting this type of wine from the testing, we began our search for the ultimate red wine for cooking.